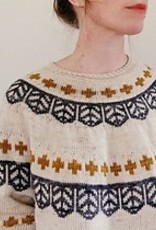 Tecumseh Sweater Pattern - Woolly&Co. 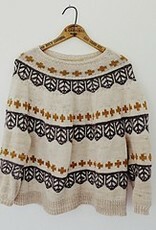 Caitlin Hunter (designer:) This relaxed and comfy sweater is my graphic, modern dream come true! 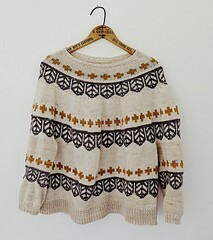 So easy to wear yet still stylish, the epitome of what I want in a sweater. Knitted from the top down with rounds of colorwork, this design is straightforward and easy to knit while still being engaging. This sweater is designed to be worn with 10-14” 25.5- 35.5 cm of positive ease. Measurements given below are for the finished circumference at the bust. See size chart on page 6 for complete fit details. The final choice of the winning name was made by Candice English, the dyer/owner of the Farmer’s Daughter Fibers, who is also a Native American woman. Both Tania (the namer) and Candice loved the name for this sweater, even though the original inspiration for the design came from a drawing of an owl. 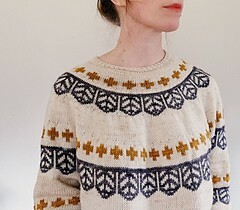 I have worked closely with Candice for several years now, and as she was a huge contributor for this sweater I felt that allowing her to select the winning name from among the contributions was a fun way to include her input in a design that she helped bring to life with her lovely yarn. I personally feel that good design can (and should!) represent many things to many people, and some of the different name suggestions we received for this particular sweater include Crusader references, Swiss flags, stained glass windows, feathers, shields and many more. I was personally moved by Tania’s suggestion of Tecumseh and her reasoning that he was a great leader who promoted unity, a sentiment that I feel is relevant to our craft. Knitting brings together people of many cultures and backgrounds, and I was proud that my design spoke to her in this way. Whatever this design says to you, I hope you enjoy knitting it and appreciate the ability of knitting to bring us closer together!